A prototype engine is being developed by the School of Engineering, in collaboration with Northumbria University, which could be used to harvest energy on the surface of Mars. The prototype engine is based on an innovative concept to harvest energy from CO2. This could transform the possibilities of space exploration, enabling energy to be created on the surface of Mars from CO2. A grant of £867k from the UK's Engineering and Physical Sciences Research Council has been secured to research a working prototype based on this group's pioneering concept. "Work is now underway to develop a prototype which may transform the possibilities for space exploration. Producing electricity from CO2 would mean that power stations on Mars could be developed, aiding long-distance space exploration. The prototype engine is based on the team’s innovative research, which would use vapour caused by the Leidenfrost effect on dry ice to power an engine." Considered the next step in engine development, the prototype will be based on the Leidenfrost effect – a phenomenon which happens when a liquid appears to levitate when it comes into contact with a hot surface (like water skitting across a hot pan). 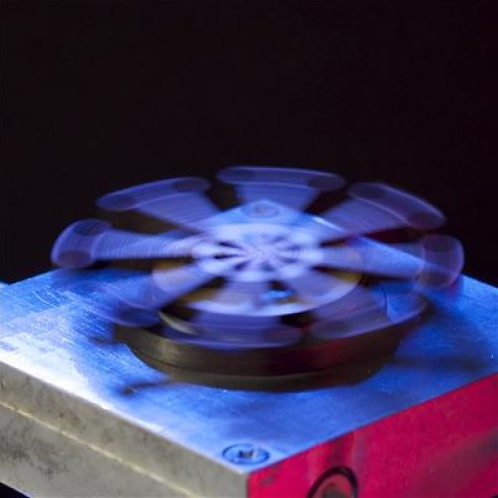 The Leidenfrost effect applies to solid CO2, known as dry ice, and this prototype will use the vapour created by this effect to power an engine – the first time it has been adapted in this way. Dry ice is suggested as a naturally occurring resource on Mars, which could mean that future power stations on the planet are a possibility, aiding long-distance space exploration. Rockets and space systems would no longer be dependent on oil and traditional energy supplies carried from Earth. Information about the prototype was first published in Nature Communications.